You got me Amazon. It’s been a long time since I’ve been this fooled on April 1st. And when you announced the new Dash Buttons on March 31st, I was 100 percent sure it was an early April Fool’s joke. Despite my confident proclamations to friends and colleagues, I was wrong, the Dash Button is a very real new product. But there was a reason why so many of us were convinced that the Dash Button was an April Fool’s prank. And that’s because it looks like a joke in many ways. Come on! A push button device to put around your house for impulse buying. Even the copy on the product page seemed to be winking at me (like the pull quote on features to avoid drunk buying). 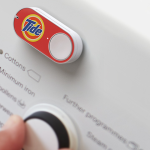 So the Amazon Dash Button is a real product, and releasing it around April Fool’s Day was a brilliant marketing strategy. And many people seem excited about the product. But aside from its aspect as an interesting Internet of Things test, I still think the Dash Button isn’t a serious product. Let’s look at some of the limitations. First, the buttons are tied to one brand, so for those of us who look for the best deal and don’t tend to be brand loyalists, it’s not that attractive. Plus, it’s another powered wireless gadget around your house. To be honest, most of us need less, not more of those. But most of all, is it really all that much of a time saver? Most of us walk around with a phone on us at all times. Pulling out a phone and ordering new detergent will probably take thirty seconds. Of course some of you will say “Jim, I need that thirty seconds! I’m a really busy person! !” Well, if you’re working on the cure for cancer, or even the next great novel, click away at your Dash Button. But let’s be honest, for most us, that extra thirty seconds will be spent watching a rerun of The Big Bang Theory that we’ve already seen three times. And taking the time to make the purchase can mean real money. Let’s stick to detergent. Anyone who buys it in the store knows that with sales and promotions, there can be big price differences, often as much as $5 off per bottle for smart shoppers. And since the Dash Button is kind of designed for bulk buying, the savings could be as much as $20. Which is real cash. To me the Dash Button is a gimmick targeted more at major brands than at real consumers, which is why it’s free to Amazon Prime users. The real customer is the product vendors. But there is an Amazon Dash product that does seem to be very cool and is a sign of how shopping will change in the future. Released last year (right around April Fool’s Day as well) to much less fan fare then the Dash Button, the Amazon Fresh online grocery site launched a Dash product that has barcode scanning and voice recognition. Not much bigger than a keychain fob, this Dash helps users buy whatever products they need, not just major brands. And it lets you scan your groceries and then log into the Amazon Fresh site to make final purchase decisions, great for looking for sales or new products that you want to try. To me, this kind of personalized and flexible impulse shopping aid is more the wave of the future, not little brand specific push buttons. I see a time when things like the Amazon Fresh Dash, or even our mobile device assistants like Siri, Google and Cortana, will make impulse buying easy and still personalized. So instead of hitting a button to just order Tide detergent, you’d tell the assistant, “We’re almost out of detergent” and the assistant would look through your preferences in brands and products and come back with the best deal at the time, or maybe even suggest a new product that you’d be likely to try. In this scenario, you’d still be saving time, and actually be getting a good deal. Plus, do you really want to be pushing buttons all over your house? If I remember from the Jetson’s, that led to a serious case of sore fingers for Jane Jetson. For more on the evolution of mobile read the Aberdeen report Flash Forward: Will the Future of Mobility Include Smartphones?